The now extinct Steller’s Sea was the largest Sirenian member measuring an incredible 30 feet in length, which was 3 times longer than the manatee and dugong of today. Greetings! Here is my ninth installment of manatee trivia, where I’ll give you a Q&A on the Steller’s Sea Cow! How did the Steller’s Sea Cow get its unusual name? The Steller’s Sea Cow was given its name in 1741 by German naturalist Georg W. Steller, who was part of a voyage of discovery to the North Pacific. What is the main difference between the Steller’s sea cow and the manatee? A. The Steller’s sea cow tail is fluked like a dugong or whale’s tail, where a manatee has a paddle-shaped tail. B. The Steller’s sea cow went extinct in the late 1700’s due to humans hunting and eating it. In 1741 there were approximately 2,000, however by 1768 the marine mammals were completely wiped out! C. The Steller’s sea cow was incredibly large, which made it 3 times as big as a manatee. D. The Steller’s sea cow also lived in very cold water and had 3 to 4 inches of fat around its outer body to protect it from the harsh marine conditions. Whereas the manatee and dugong live in warm tropical waters with very little body fat. 3. What was the average size of the Steller’s sea cow? The Steller’s sea cow averaged 30 feet in length and weighed an incredible10 tons! Clearly, the Steller’s sea cow was the biggest member of Sirenians and was much larger than the manatee and dugong of today! Was the Steller’s sea cow an herbivore like its manatee and dugong cousins? Yes, the Steller’s sea cow was an herbivore just like the manatee and dugong. Its diet consisted of seaweed and kelp, which floated near the coast and the ocean surface. This made the hunting of the Steller’s sea cow very easy. Where could you find the Steller’s sea cow? The Steller’s sea cow was found in the very cold waters of the North Pacific, especially around the Bering Island. Did the Steller’s sea cow have teeth like manatees and dugongs? No. The Steller’s sea cow did not have teeth. Instead it had pads of keratin with v-shaped ridges that were found in the upper and lower jaws. It used these pads to grind up plants. 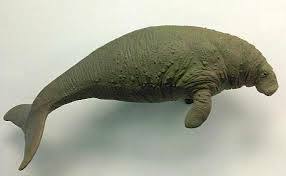 Was the Steller’s sea cow related to the elephant like its dugong and manatee cousins? Yes! It had very thick bark-like skin much like the elephant and manatee of today. 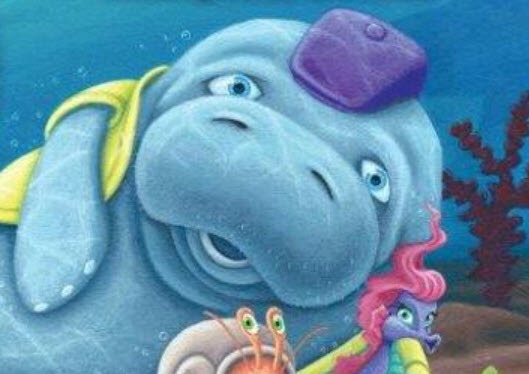 What color was the Steller’s sea cow? The Steller’s sea cow had brown-colored skin with areas of white spots. Manatee Trivia (Part 9) – More about the Steller’s Sea Cow!